USG Alabaster employees welcome guests to the open house. ALABASTER Twp. 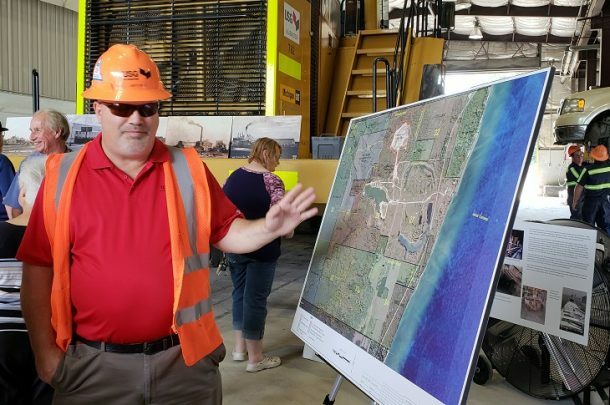 – “We started here, we’re staying here,” was the recurring message delivered at United States Gypsum Company’s Alabaster quarry open house and tour on July 12. Focusing on an ongoing 17-year perfect safety record, advanced mining equipment and technology and environmental responsibility, the company is seeking support from the local community to promote its plans for the future. USG is proposing to expand its current operation through the purchase 580 acres of land with mineral rights adjacent their existing quarry in Alabaster. The property would be purchased from the State of Michigan, and proceeds from the sale will be used to support the Department of Natural Resources (DNR) conservation efforts, according to the company. Plant Manager Matt Craig welcomed guests by showing a brief video presentation outlining the history of the company, its contributions to the local economy and its plans for the future. George Gentges, a 29-year USG employee, guided visitors on a bus tour of the quarry operation. He touted his company’s adherence to industry safety standards and Michigan Department of Environmental Quality (MDEQ) regulations, as well as the stability of being employed by USG. “There have been no layoffs, and it’s not seasonal,” he said. Gentges showed visitors the company’s $1.4 million mining machine in action. Manufactured in Germany by Wirtgau, the mining machine cuts into the ore at a precise depth, and eliminates the need for a crusher or for blasting, except for water control, according to Gentges. Gentges also stressed during his tour that the company takes care of the environment, as the property is “restored to its natural state,” when mining operation is completed. “This will be wetlands when it’s all done,” he said. Gentges added that wildlife, including bear, lynx, deer and coyote, have all returned to the restored property, and that a free fishing weekend was recently hosted by the company at one of the lakes formed as a result of the company’s activities. USG plant manager Matt Craig discusses the proposed new quarry site. It keeps a historic Michigan company working in Michigan. It maintains Michigan’s supply of gypsum, a key building block for our economy. It keeps a quarry operation where one already exists. It puts nearly 600 acres of land back on regular tax rolls. It supports the DNR’s conservation projects in the region. It supports the local, regional and state economy. According to a press release from the Michigan DNR, a public meeting to discuss a proposal from United States Gypsum Company to acquire state-owned land and mineral rights in Iosco County and the subsequent recommendation on the proposal from the Michigan Department of Natural Resources was held Tuesday, July 17. The meeting was scheduled from 5:30 to 7:30 p.m. at the Alabaster Township Hall, located at 1716 US-23 in Tawas City.